ECIPE is now looking to fill in an internships position, as Research Assistant in Trade & Digital Policy, starting in September 2019. 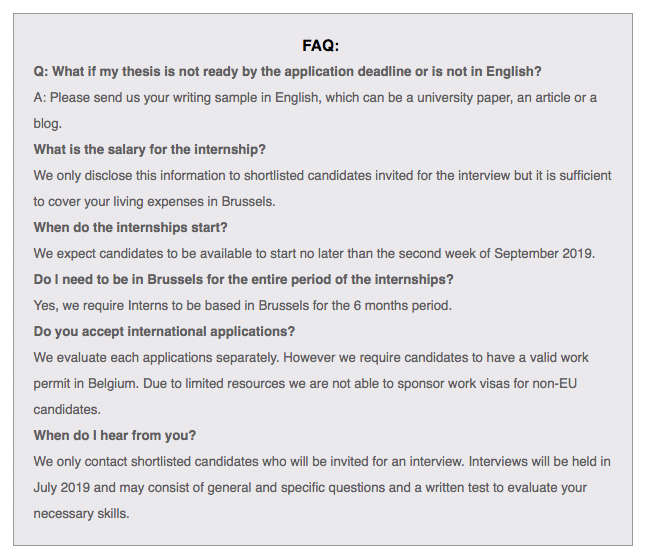 The ECIPE internships are remunerated and last until end of February 2020 with a possible extension until July 2020. Undertake other administrative tasks and assignments as required. A successful applicant will have a Master’s degree in international political economy, international economics/trade economics, political science or international relations. The applicant should have an interest in trade policy, technology, and digital economy. For non-economist applicants: basic knowledge of economics and good numerical skills, including MS Excel is compulsory. Applicants should demonstrate research and writing skills, be organized and pay attention to details. Proficiency in English is required. We are particularly looking for applicants with an excellent academic record and with a strong interest for a future career in academia, journalism, or policy making. Preference is given to candidates who have completed their Master’s degree recently. Applications deadline is 23:59 June 23, 2019. The documents should be sent to jobs@ecipe.org as one PDF file. Please note that we only contact shortlisted candidates by July 5, 2019. The European Centre for International Political Economy (ECIPE) is an independent and non-profit policy research think tank dedicated to trade policy.